Here is the circuit diagram of an ultrasonic mosquito repeller.The circuit is based on the theory that insects like mosquito can be repelled by using sound frequencies in the ultrasonic (above 20KHz) range.The circuit is nothing but a PLL IC CMOS 4047 wired as an oscillator working at 22KHz.A complementary symmetry amplifier consisting of four transistor is used to amplify the sound.The piezo buzzer converts the output of amplifier to ultrasonic sound that can be heard by the insects. Assemble the circuit on a general purpose PCB. The circuit can be powered from 12V DC. The buzzer can be any general purpose piezo buzzer. The IC1 must be mounted on a holder. I think easy to test the circuit whether functioning or not is possible easily. Take multi meter on 10 volt AC range with series a capacitor of .01 mfd disc type and measure on the point where pizzo point connected . If the meter deflect then it is functuionin. 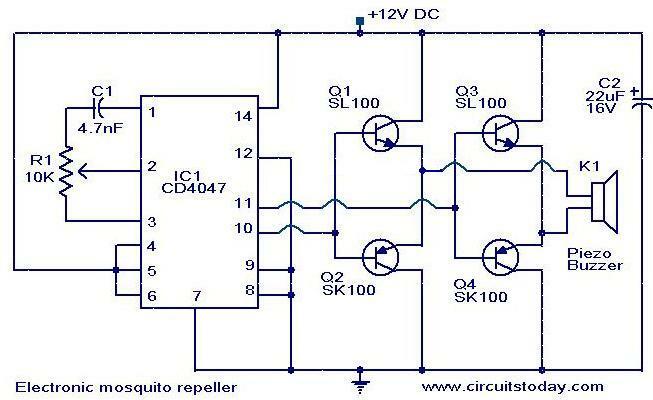 Is circuit able to repel both male and female mosquito ?? Kind of new at this. The sk and sl 100 transistors? IS there a part number or other Identification? I can’t find anything by those numbers. Hello, Im an norwegian engineer-student, and I am having your circuit as a project, both making and attempting to explain it. Making it wont be that much of a problem, but understanding it is a little more tricky. I wondered if you could explain a little bit how/why you have used 4 transistors, for example, and why this circuit will work the way it does. It would mean a lot to me! And, could you answer me by mail by some chance? Hi This is called bridged push pull output. This circuit will provide 4 times the normal 2 transistor push pull output connecting through a coupling capacitor. IC 4047 is an oscillator whose frequency is set by R1 & C1. The complimentary output of the IC which is available on pin no 10 & 11 are fed to the bridged output circuit. Since the frequency used for repelling mosquitoes is in the ultrasonic range a piezo transducer, which respond to Ultrasonic sound better is used for producing sound, instead of standard loud speaker. The mosquito project is nice please, explain how to make the circuit? Hi Goitom the construction hints are clearly given in foot notes just below the circuit diagram. We’re a group of volunteers and opening a brand new plan in our little local community. Your website offered us with beneficial info to work on. You have done a striking position and our complete community shall be thankful to you. iam a second year student.does this project works well? what is the use of this circuit? which type of output waveform will appear on oscilloscope? which type of waveform will b appeared? Hello sir ,can i remove the buzzer and check the frequency on CRO ??? You can remove the buzzer and check the frequency on Oscilloscope. CD4047 has very good applications. Oscillator function of Cd4047 is Damn good.My Suggestion is Better to use RPS with output 12V D.C for regular use at home because battery not stands for long time . I like this electronic mosquito repeller. . . . i want more detail about this project……. please….. I connect the circuit as it is ……. But it not working properly… Why it so happened???????? hi.i used piezo buzzer and we didnâ€™t hear any sound,is there any alternative? also instead of mosquitoâ€™s what can we use to test this experiment. Pls friends am just a computer technician from nigeria who is very much interested in electronics.pls contact me by my email omoghaghaekes@yahoo.com thanks . Will this circuit scare of the squirrels?? i dont want that to happen. Hi Zunnur there are so many makes available. you can use the one meant for car stereo add on tweeters two small one comes in a pack. clarion etc. Thanks for the ckt diagram.Would u please inform me the model number of the piezo tweeter available most in market. Hi Susan connect 4.7nF in parallel to C1 the oscillator frequency will be in audible range. now check any out put is there if not check all the components and IC pin connections. if it gives audible sound, remove the capacitor connected in parallel, the circuit is ready for use. Piezotransducer will emit the in audible signal of the oscillator. sound level indicator is an equipment to measure the sound level (noise level) in an environment. they operate in human audible range only. sir,we want a method to check the circuits. what about that piezo transducer or that sound level indicator? can you please explain this? can that be used to check the circuit? can i used pic 16f877A TO THIS CIRCUIT?.. No need of 16f877a. CD4047 is enough because it is simple and low cost and works well as Oscillator. hi.i used piezo buzzer and we didn’t hear any sound,is there any alternative? also instead of mosquito’s what can we use to test this experiment. yet this circuit does not work? please can you list all the components that are use and their specification,my school approved this as my project. May I know what is the formula calculation for this result as you mention? How we calculate it? Thanks. Seetharaman. The above is the data for CD4047. From this you can calculate. Actually what range of the output frequency can be generate by this circuit? How we calculate the output frequency? Got any calculation formula? Thanks. Hi Phuah it should be ok as we require the frequency around 18 to 22kHz to drive them. I am confused with this circuit if I want the output frequency to be between 20khz and 30khz what values of R and C should I USE????? C2 is an electrolytic capacitor and they are available in different voltage ratings, from few volts to hundreds of volts and thats why its a common practice to represent the voltage rating of electrolytic capacitors in the circuit diagram. C1 is a ceramic capacitor and the commonly available ones are rated from 50V to 400V. Some manufacturers represent the voltage rating using some code while others not. Any way we can guess that a commonly available ceramic disc capacitor will be rated at least 50V or so. Here the working voltage is 12V and a 50V ceramic capacitor will be more than enough. Hi Seetharaman, thanks for your respond. Can this circuit work with Piezo Tweeter with 98bd, 20khz. Is it workable to repel the mosquito? Hi Phuah see the following data sheet. you can use Peerless tweeters also. You can construct a variable frequency oscillator (function generator chip like ICL8038) and use it by shifting the frequency often. Hi Seetharaman, may I know what type of the output speaker is most effective for pets repellent? How can I make a frequency for all range of pets include rat,mosquito, mice and spider? Thanks. Hi Bhaskardev piezo tweeters are the only inexpensive device which can respond to high end of sonic frequencies. Hi Zaman these small speakers may not respond beyond 11 to 12kHz. only hi-fi tweeters can respond they will be quite expensive. Hence Piezo tweeters are quite in expensive. this is normally used as additional attachment with car system speakers or part of portable sound system. you can use them. Can I use table clock mini speaker instead of Piezo Buzzer? can i use 20khz mp3 file played on speaker? What is the Cost of the IC and the 4 transistors …Pls tell me approximately!! I am a chemical engr by profession. I need an electronic mosquito repellent which may be powered by 9 volt battery, for my personal use in travelling. I assembled mosquito repellent circuit. I am observing, mosquitoes are not affected by this. I donâ€™t know whether the circuit is working or not. I used a piezo tweeter which works with 8000+ frequencies which I can hear (in other tests). I want to know where to be connected with No 2 leg of IC 4047. Can you please suggest me in this regard? If it works, I want to assemble few more for our use. Can you suggest me how to make a mosquito repellent with Variable Frequency (from 16 kHz to 45 kHz+) with sufficiently powerful output so that it should be sufficient to a 30 X 40 house. Or can you prepare me one such piece? There are also insect repellent products available based on sound production, particularly ultrasound (inaudibly high frequency sounds). These electronic devices have been shown to have no effect as a mosquito repellent by studies done by the EPA and many universities. Thanks alot for the cct! But my question instead of ic,can one use multivibrator circuit to generate the frequency! Since T(time const)=RC and we know that F(freqency)=1/T.We just make capacitor const and increase our resistor value to generate 20khz and above.Then connect output of our NPN collector with ultrasonic transmitter! Can it work that way? Thanks for reply. Can u do me another favour by telling the number of resisters used and the specifications of resistors.If there is any diode used please tell me the numbers and specs. Hi Fahad the number of transistors are 4 and IC is one. The transistor are SK100 PNP general purpose transistor. SL100 NPN general purpose transistor. you can use the recent types 8050 for SL100 and 8550 for SK100. please tell me the number of transistors used in this circuit and value of these transistors. thanks to both of you. Hi sourov Badeekh is correct it is a variable resistance to change the frequency of oscillation. Hi Sourov, its not a thing to be confused, clearly, its a variable resistance.. n Thx Seethharaman! is R1 a relay or resistance or variable resistance? i am confuse. plz help me. Thx Sir, i bought the components today, just last thing, i got 40MHz ultrasonic transmitter, is it ok? Hi Badeekh you cannot use piezo buzzer they have built in electronics for producing music or sound. piezo transducer or piezo tweeter. you can use ultrasonuc transmitter (sender transducer), ensure that they are capable of reproducing from 20kHz. Hi Seetharaman, m going to assemble it, just confused about the sound source, shoud i use simple piezo buzzer or the ultrasonic transmitter available in market? What is the subsitute for this IC, and the transistors ? Many researcher says that Electronic mosquito repeller doesn’t work. Is it true? please add the circuit diagram using NE555, because it’s not easy to found IC1 CD4047. Hi Hider since the frequency generated is beyond our hearing it will be difficult to hear, but you can make a sound level indicator using a condencer mic with suitable electronics. Piezo transducers can respond from around 1kHz to beyond audible range. they are normally used as tweeters in hifi loud speaker systems. Browse through all our articles. You will gain good knowledge. HI IS THE COST OF MAKING THIS CIRCUIT WILL BE ECONOMICAL?AND IS THE EQUIPMENTS AVAILABLE IN ALL ELECTRONIC SHOPS!!!!!!!! can I use transistors BC556 and BC546? Hi! Did anybody tried? Is it really working? In what room size the circuit works, 10×10, 15×20,….? Hi Haris if you remove the transistors IC may not be in a position to drive the Piezo tweeter directly. CAN I REMOVE THE TRANSISTORS FROM THE CKT??? Hi Pooja the sound produced by this device irritates them and they become either sluggish or defunct or try to fly away. Thus they are driven away from the visinity. how does electronic mosquito repeller work? another one question, if we remove 22 mf capacitor then what will happen? and is the piezo buzzer is the example of piezoelectric sensor? thanks for the circuit… but i want to know how the ic cd4047 works in this circuit(does if change the electric signal to sound signal)…and does variable resistance change the output frequency..
plz reply me.. as soon as possible…. Hi Senthil the ultasonic frequency range is just beyond human hearing range of 20KHz to 100KHz. There transducers available for sender and receiver. you can use them with amplification and detection and convert into signal strength with a DMM in Volt/mV range. very nice and useful circuit.can u pls tell me how to check the ultrasonic frequiency.is there any such circuits avilable? Hi Biomer you can use NE555 timer IC with one transistor and tweeter. There is no equivallent for CD4047 it is a standard digital ic. What is the CD4047’s alternative for this circuit. Hi Prakash you can use 16 ohms tweeter or two 8 ohms tweeters in series. Pl. tell me, instead of piezo buzzer can i use any speaker. If yes pl. give me idea. Hi Isuru 4.7n will be written as 472 and voltage will be written in 63V etc if it is Japanese it will with J etc for voltage, here 16volt and above capacitor will do. i happened to see your article in the site. i am 60 now. about more than 20 years back i was testing such articles as a hobby. now due to over age and due eye problems i am unable to do any work. will you kindly assemble one and send me for my household use, because we are suffering from heavy invasion of mosquitoes at our city. further the use of chemical repellents make my asthma problems more aggravated and throw me to admission to hospitals for emergency attention. i am ready to send the cost in advance if you can kindly mail me the details. rather if it is at market it may please be informed. thank you very much for your publication. i further wish you to develop many projects which are needed for the people’s welfare and publish such in the website. thank you one again and expecting your reply. is it safe for humans and pets like dogs. . .
pls i need full detail about this repeller and how it work and if i want to build it the capacity of the componet i wil use thank you GOD blessed you. hi…… thanks for this circuit but tell me what is the voltage of capacitor C1 4.7nF or else can use any other capacitor? what is the use of the 10k variable resistor and what should be the correct resistance tune for the variable resistor? Hi Vignesh This circuit is based on the simple principle that insects gets immobilised or driven away by using ultrasonic sound above 20KHz. The above circuit operates around 22KHz. You can try by assembling and try to direct it towards the group of mosquitos, you can see the results for yourself. K1 should be Phiezo tweeter (used in two in ones for hi frequency reproduction). realy is it usefull? i want full explanation about that circuit? IS IT WORK WITH 9V BATTERY. After completion the circuit How will I understand that it is working properly? Hi Wandera the cockroaches will not respond to electronic sounds. chemicals are the best solution for them, the combination of which should be changed regularly – immunity problem. Hi ,apart from mosquito ,can we get alternative for cockroaches . Hi Vijay you can try NE555 as an astable. Hi!!! Is there any replacement for the IC?? Can i use any other IC other than CD4047? Hi Sonny you can try to assemble a variable frequecy oscillator in the range of 16 to 20KHz with a suitable amplifier and a HF transducer(ceramic tweeters. This range will affect only mosquitos not other living things. You can find out at what frequecny the mosquitos flie away as your sounder approaches them. Thank you for the info, is there any alternative circuit(for mosquito repeller) that i can use in our piggery that will not affect my dog? Hi Sonny with pigs it should not be a problem with dog you will have lots of problem as they can hear it. Is this mosquito repeller can be use in our piggery? we noticed our pigs had several bites from mosquitos. Since this circuit is operated in sound frequency above 20khz range, would there be any side effects in our pigs? Hi Adnan for this low power radiation at 22KHz will not have any effect on human health. its a safe device or is thee any side effect of 22khz frequency to human health? Hi Digonto yes you can. 12 volt 100mA is sufficient. Can I use a transformerless power supply(12V 100mA)for this circuit ? I need a 1kva inverter circuit a full explanation of it, thanks. I want more information about this project and how to attached a speaker to this project???? ?